In the past, Mac users could use the Command + Shift + 3 and Command + Shift + 4 to capture screenshots of the full screen and a region respectively. Those screenshot shortcuts are still available, so you don’t need to rewrite your muscle memory. 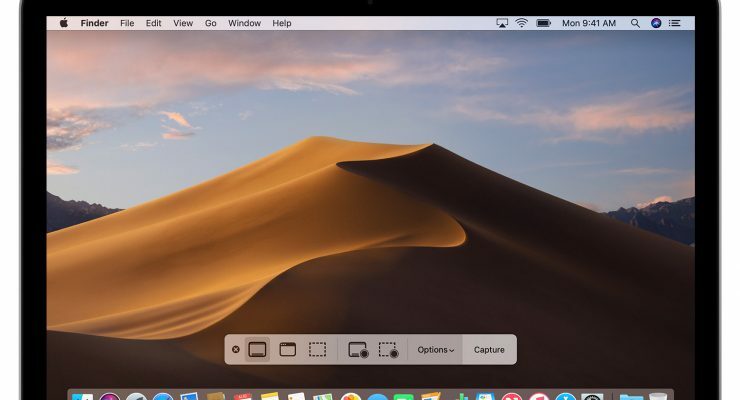 But Command + Shift + 5 now invokes the new Mojave screenshot tool, aptly named “Screenshots.” This application provides a useful floating GUI for taking, saving, and editing screenshots. It’s very similar to the screenshot tools found on iOS 12. 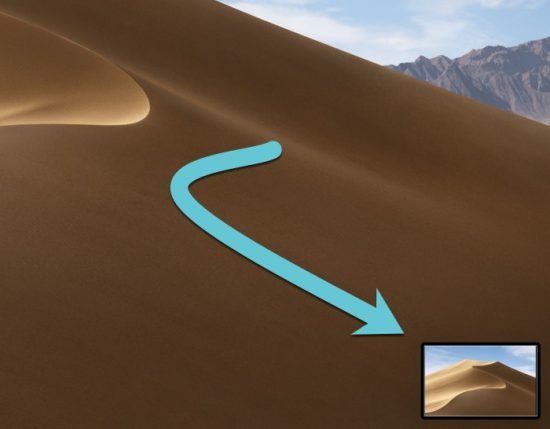 Let’s examine the new Mojave screenshot tool varies from the old way of doing things. Pressing Command + Shift + 5 will open the new Screenshots toolbar at the bottom of your screen. It can also be accessed by opening the new Screenshot.app found in /Applications/Utilities. Close: the “x” closes the toolbar without taking a screenshot. Capture Entire Screen: take a screenshot of everything on the screen. Capture Selected Window: take a screenshot of only the foremost window. Capture a Selected Area: drag a box around a region to capture. Record Entire Screen: record a video of the entire screen. Record Selected Area: record a video of the selected region. The first three capture still images and relate to the keyboard shortcuts Command + Shift + 3, Command + Shift + 4 + Space, and Command + Shift + 4, respectively. Those old keyboard shortcuts are still fully functional in Mojave, so feel free to continue using them. But if you take infrequent screenshots and forget the keyboard shortcuts, you can access them through the Mojave screenshot tool’s toolbar. The last two capture methods record videos. If you’ve ever used Quicktime to capture a screen recording, you’ll recognize the functionality. It’s been essentially moved from Quicktime’s screen recording functionality to the Screenshots toolbar. To start a video, select either of the two record options and press the “Record” button in the toolbar. To stop the recording, press the Stop button in the Touch Bar (if applicable) or in the menu bar. Capturing a screenshot or screen recording will create a floating thumbnail in the lower-right corner of your screen. If you click on this thumbnail, you’ll have the opportunity to annotate or edit your screenshot before saving. You can read more about annotation further down. Click on the “Options” menu in the toolbar to reveal more options. 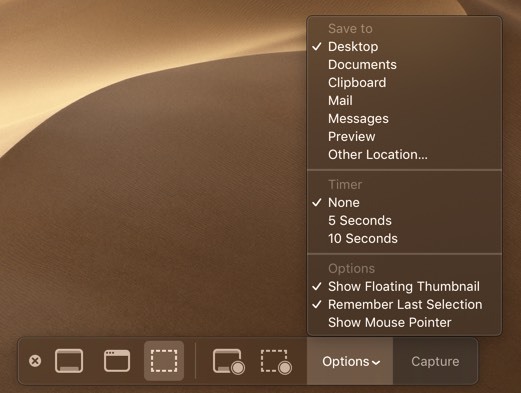 If you’ve been taking screenshots for a while, the Mojave screenshot tool presents some familiar options. You might notice that these are a combination of the old Terminal defaults (save location) and functionality from the now-defunct Grab app (timer). 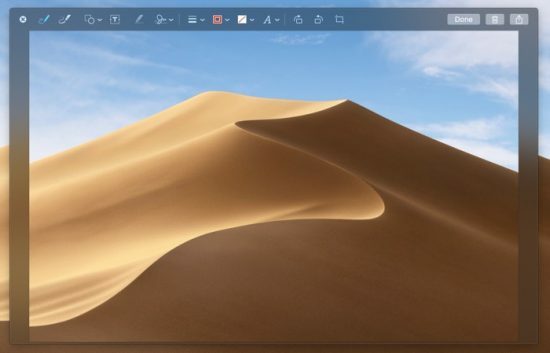 The Mojave screenshot tool makes them much more useful, collecting them in one place. The first section allows you to select the target of your screenshot. By default, the screenshot won’t be saved there immediately. If you don’t interact with the screenshot thumbnail, the screenshot will be saved to this location. Also, if you capture a screenshot with another method, like the Command + Shift + 3 hotkey, that screenshot will be saved to the location you selected in the Save To menu. In fact, this location will “stick” until you change it, so it can be highly fire-and-forget if desired. “Clipboard” will copy the screenshot to the clipboard after capture. Use the “Paste” command (or the Command + V keyboard shortcut) to insert the screenshot into an editable field. 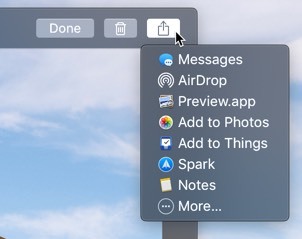 Choosing an application (Mail, Messages, or Preview) will open the screenshot in that application immediately. “Other Location …” allows you to set a specific folder as the screenshot’s destination. If you select a location, it will be included in the destination menu later. The timer functions as expected. There are presets for none, which captures the screenshot immediately. Five and ten seconds makes you wait that many seconds before capturing the screenshot. At the bottom, we have miscellaneous options. “Show Floating Thumbnail” controls the post-capture behavior. Keep the option checked, and macOS will display a temporary thumbnail after capture and before saving to disk. “Remember last selection” saves the region selection box used last, allowing for easier repeatable screen captures. For example, if you’re capturing the same window repeatedly, repeating the capture region is perfect. “Show mouse pointer” controls whether or not your cursor appears in the screenshot. Once you’ve set your settings as desired, click the “Capture” button on the far right of the toolbar to capture a screenshot. Once the screenshots are captured, they will appear as a small floating thumbnail by default. This thumbnail will float in the corner of your screen for several seconds before disappearing. If you click on this thumbnail, you’ll open the screenshot in the Markup window. In the Markup window, you can use all of the annotation tools from Preview on your images, including arrows, shapes, text, and signatures. It’s not an incredibly broad range of tools, but it covers the most common use cases. When finished, click the “Done” button to save the screenshot to the location chosen in Options before capture. The trash can icon will delete the screenshot, and the sharing icon provides options for exporting to other apps. Once you share the screenshot through the share sheet, it’s safe to delete it. Screen recordings also appear as thumbnails, but the regular markup tools can’t be applied to videos. Instead, clicking on the thumbnail will reveal an edit HUD, allowing you to trim the clip with the button next to Done. The new Screenshots tool in Mojave is a major upgrade from the previous tool. With the benefit of a graphical interface, taking a screenshot is easier, clearer, and more robust. While third-party tools like Snagit still offer significantly more editing and markup tools, Screenshots is a major upgrade for all Mac users. Capture does not work. There is no icon on the command bar at the bottom of my screen. Command+shift+5 brings up a selected rectangle that I can adjust. Cannot do anything else with it. No toolbar appears. Also I get the same result if I go to Application/utilities/screen app…it just brings up the rectangular preselected portion. .? ?